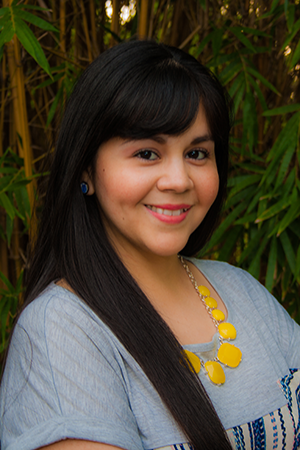 Patty Taméz (’07) works as campus coordinator at Oracle, and previously worked at UH’s University Career Services post-graduation. She earned her Bachelor’s degree in Business Administration in Marketing, with a minor in Spanish for the Business Professions. A native Houstonian, avid Cougar Athletics fan, yoga-lover and active volunteer, she loves cheering on the Coogs and enjoying the festivals, great food and cultural diversity her home town has to offer. What was it like to become a full-time UH employee right after graduating, and can you describe your job at University Career Services (UCS)? It was amazing to be back on campus — but this time, no homework or exams! Throughout the interview process, I was really looking forward to giving back to my university. UH students are incredibly unique, and I knew I would be able to connect with them being a recent graduate. I was extremely involved in many events around campus as a volunteer, as an ambassador to promote our services, and as a proud alumna! I’ll never forget being part of ESPN’s College GameDay, the first ever at UH. My role as the Campus Recruiting Assistant involved building relationships with employers in various industries to recruit UH Coogs for full-time, part-time, and internship opportunities. I managed the campus recruiting program and helped plan, coordinate, and execute career fairs, workshops, and other career-related events for students and employers. Throughout my five years there, I was able to lead our marketing efforts through the growth of social media, marketing collateral, and oversee the annual publication of Career Visions, a student resource guide, as well as having several career-related articles published in The Daily Cougar. I also created the UCS Marketing Committee, where I served as secretary and team lead. The programming part of my role was also fun as I co-created the “UCS Ambassadors,” a student ambassador program, as well as “Passport to Career Success,” a professional development program that my colleague and I designed and earned a grant. You recently moved out of education to start your position as campus coordinator at Oracle – how is your current work different, and how have you adapted your skills for a business environment rather than a higher education environment? My degree is a Bachelor of Business Administration in Marketing and I never really thought I would work in education, especially higher education. My role at UH taught me so much and how much I enjoy helping students. After UH, I spent nearly two years at Rice University working with MBA students in a career services setting when a tremendous opportunity came up to go into corporate. As a Campus Coordinator at Oracle, my role has shifted into a human resources role. I work very closely with students from the time they apply, all the way through prescreening, interviews, paperwork, travel, and training. Conversely, I now foster relationships with the career services offices ensuring we have our employment opportunities posted and promoted, as well as ensuring we have a strong company brand on campus by attending career fairs, workshops, and being connected with student organizations. My background in recruiting has definitely been a plus, and working in two higher education institutions has been helpful as well. One of the major differences is that my office is at home. My teammates live all over the nation, but we still all collaborate on our projects and tasks. It’s been a smooth transition, as I’m able to create my own schedule. It has taught me new skills, like communicating effectively through technology, learning new software, and being disciplined by creating timelines for my projects and tasks. What brought you to UH? What was the defining factor in your decision to enroll? I was a scholarship recipient to attend Cornell University for their summer college program back in 2001. Although I loved it, I didn’t love being away from my family. Even before my summer semester was over, I knew that I wanted to be as close to home as possible for college. After learning more about UH, the degrees offered, the faculty, and the diversity amongst students, I was SO excited to have found the school I wanted to earn my degree from. After receiving my acceptance letter and scholarship offers, it was time to officially decline the other schools because this girl was going to be a Coog! Nine years after graduation, and I know that my decision to choose UH was one of the best decisions I’ve ever made. After seeing how much I love UH, and being a Coog, my sister, Christy Jullien (’12), also chose UH. Did you have a favorite professor or class at UH, or any other favorite UH memories? This is hard to answer when you had incredible professors! Many of my favorite memories involve two organizations I was a part of: the Hispanic Business Student Association (HBSA) and the Program for Excellence in Selling (PES). Being part of the HBSA not only allowed me to meet new people locally but I was also able to travel to a few cities in the nation for student conferences. It was a great experience to be part of a professional organization because I learned to be a leader, how to network, how to dress for professional events, and how to promote myself for the job I want. Through HBSA, I was able to successfully obtain two marketing internships. My journey started with “I need to add things to my resume” and to my surprise, I learned a lot about myself. I was involved in various committees, attended a couple of student conferences on scholarships, obtained both of my internships through networking, and received two academic scholarships. I worked on campus at the Writing Center for two years when I first started college. It was an incredible first job that has helped me so much during my college career, but also now. From meetings, to community service events, to tailgating, my college experience would not have been the same without being involved on campus. What are your hobbies, and what do you enjoy about them? I started practicing yoga about a year and a half ago — I started volunteering at my local studio and I was immediately hooked. I practice about 5-6 times a week, and each time I feel both physically and mentally stronger and better. I also volunteer at the Hobby Center a few times a month. Last summer I was awarded the bronze award for working over 20 shows (my total was about 80 hrs for the 2014-2015 season). This year marks my 4th year there, and I’m aiming for the silver award (minimum of 120 hrs). Last year I also got involved with Bauer College Alumni Association (BCAA), mainly on the Marketing Committee. I help maintain a strong brand through our social media sites, as well, as recruit Bauer alumni to be involved with BCAA. What are you most excited about right now? A particular topic, project, event, life circumstance – anything! I recently got engaged to my boyfriend, and we are both incredibly happy and overwhelmed with all the love and support from family and friends. He is a United States Coast Guard veteran and former UH student, planning to re-enroll soon to finish his degree. We both love UH and we’re excited that we are first time season ticket holders for the upcoming football season. We love supporting anything UH and I know we will find a way to incorporate red and white for our special day. Congratulations! UH weddings seem to run in the family! What advice would you share with current or prospective UH students? I would say, don’t worry if you don’t have a major declared on your first day of school, or even your first year. Take the time to explore classes and meet with your career services office, they’re there to help you! Connect with other students by joining student organizations, whether they’re academic or social. They’re a great way to meet fellow Coogs. Be involved with your career services office and attend career fairs and workshops. Networking is key for internship and full-time employment, even when you’re not searching, it’s always good to start your networking circle. I would also say to be involved in campus activities and not “just go to class.” Be there for the fun things too! There is almost always something going on at the Student Center. Attend football games, become involved in your college, work on campus, and participate in Cougar Red Fridays. You chose UH, so choose to be proud of your school!